For this recipe you will need a blender. For the chicken tikka, cut the chicken into cubes large enough to be skewered (about 4cm/1½in cubes). Rub salt and pepper into the chicken and set aside. In a blender, add half the yoghurt and all the remaining tikka ingredients. Blend to a smooth paste. Transfer to a large bowl and whisk in the remaining yoghurt. Taste to check for spiciness and add more chilli if preferred. Mix the chicken in the yoghurt mixture. Cover with cling film and, if possible, leave the chicken to marinate in the fridge overnight, or at least 4–5 hours. For the naan bread, combine the yoghurt, milk, salt and sugar with 200ml/7fl oz water. Sift the flour and baking powder into a large mixing bowl and make a well in the centre. Pour in the liquid and 2 tablespoons of rapeseed oil. Mix to form a soft dough. Knead for 5–6 minutes, or until the dough stops looking ragged and becomes smooth. Cover the bowl with a damp tea towel and set aside to prove for 30–40 minutes. Remove the dough and knead for another minute or two, then return to the bowl. Cover and leave in a warm place for 1–2 hours. For the salad, combine all the ingredients in a bowl. Refrigerate until ready to serve. 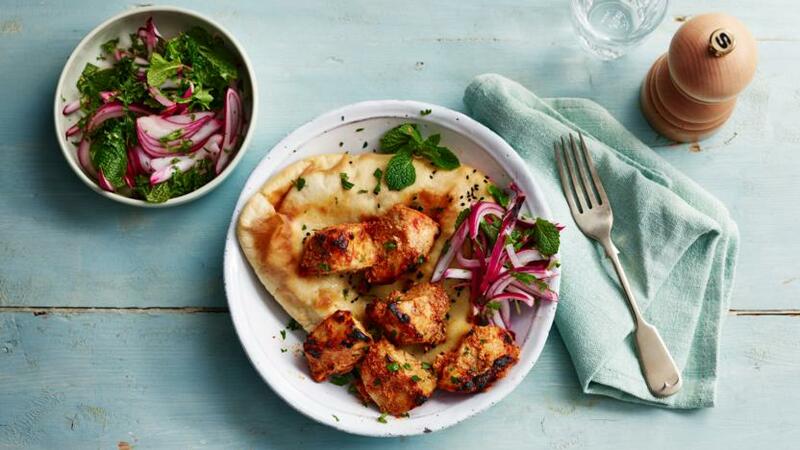 Grill the chicken for 8–10 minutes, basting occasionally with the yoghurt marinade. To check the chicken is cooked through, take one of the largest pieces and cut in half. If there is no sign of pink and the juices run clear the chicken is cooked. To cook the naans, lightly oil a work surface and divide the dough into 4–6 balls. Using your fingers or an oiled rolling pin, flatten each ball into a round shape about 1cm/½in thick. Keep the remaining balls of dough under the damp tea towel as you work. Heat a large, dry frying pan with a tightly-fitting lid over a medium heat. Transfer one circle of dough to the pan and cover securely with the lid. Cook the naan for 3–4 minutes. When it is golden-brown, mottled and puffed up, flip it over and cook the other side for 3–4 minutes. Repeat with the remaining dough. While the naan breads are cooking, melt the butter and mix with the remaining rapeseed oil. As soon as the naans are cooked, spread them generously with the melted butter mixture and scatter with sea salt, nigella seeds and poppy seeds. Set aside for a few minutes.